If there is one thing we are really good at here in Darvonda, it's trying new things. Life is in a constant state of change and we have a knack of embracing that change. Starting out as a one horse pony enterprise, our company has grown to include 100's of different methods, customers, employees and crops. Never one to sit on our laurels and wait until the change overtakes us, we actively look for new programs to enhance the core Read more..
Tens of thousands of Belgian chrysanthemums have begun to pour into garden centres, supermarkets and big box stores all across BC and other Western provinces, bringing vibrant new colours and a fresh flush of flower power to flagging gardens. It is no exaggeration to say that mum’s the word in garden circles this month. It has been thus for more than a decade, ever since nurseries perfected the art of growing chrysanthemums into beautiful globe-shaped bushes of Read more.. 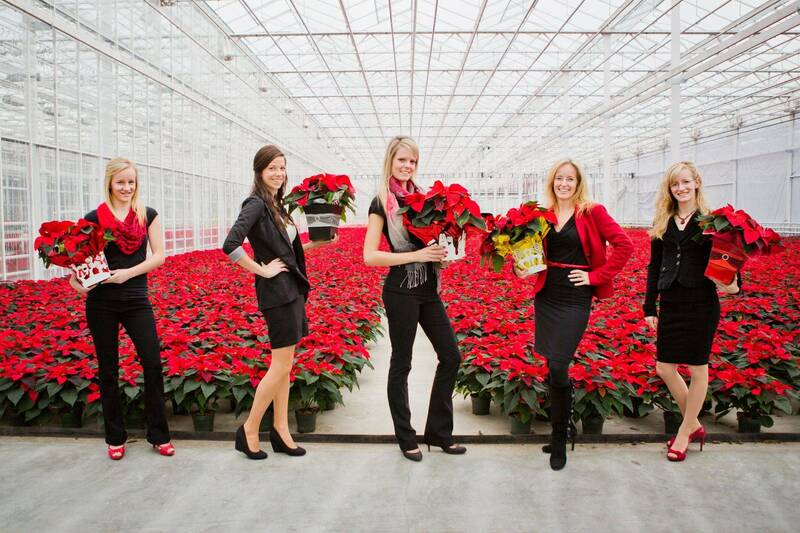 Nothing says Christmas like a bright red poinsettia. Millions of them will be sold over the next month to decorate homes and offices, restaurants, bars, shops and hotel lobbies. In Europe, they like their poinsettias small and compact. In North America, we like them big and beefy. White and pink and quirky novelty varieties with speckled or variegated foliage sell well early in the season, but once we get into December and start to close in on Christmas, consumers Read more..
A career in which you are surrounded by flowers is not the equivalent to puttering in a garden says Fiona Jansen, retail manager for Darvonda Nurseries Ltd. in Milner. "It's not relaxing, but it is exciting." Says Jansen. Jansen says people often exclaim how lovely is much me to work around flowers, and how relaxing it is. It can be hectic at times, but always interesting, with variety daily and seasonally, and competition in the industry keeping it exciting, she says. Darvonda Nurseries Read more.. Priority is to reduce the mountains of waste plant pots. Millions of plants in plastic pots are sold at garden centres, nurseries, supermarkets and big-box stores at this time of year. What many gardeners don't realize is that most of the pots - an estimated 359 million pounds of plastic a year in North America - end up being tossed into the landfill because they can't be recycled. Some gardeners hang on to a few pots to use when dividing yo perennials or growing new plant from Read more..